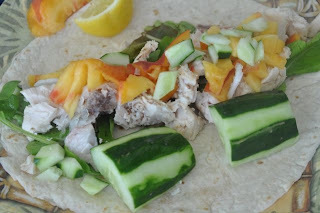 Tonight, I made a delicious and "sassy" dinner out of my Chubby Bunny CSA's fruits and veggies and some local swordfish steaks cooked on the grill. The sweet, spicy, crunchy, tangy, pungent taste of the homemade salsa with the freshly grilled and local swordfish was amazing. Brush swordfish steaks with olive oil. Over a medium heat, grill swordfish steaks until just cooked through. Cut into bite sized pieces and set a side to cool. Refrigerate if necessary, but serve at room temperature. Grill tortillas over a medium fire until grill marks show on the tortilla (don’t over cook or the tortillas will harden and be too crisp and likely break when you try to wrap the ingredients). For the salsa, combine peaches, onion, cucumber, jalapeno and cilantro in a bowl and toss with lemon juice. * Tonight, I used store bought tortillas but next time, when I have more time, I'll buy some locally grown flour and try this homemade flour tortilla recipe. from Cooks.com.